A private commercial real estate investment group dialed in on Verizon’s Colorado Springs corporate campus, acquiring the 125-acre property for $31 million, according to public records. Westside Investment Partners, under the name GOTG LLC, purchased the 724,086-square-foot Verizon Regional Operations Center at 2424 Garden of the Gods Road from Verizon Business Network Services Inc. of Basking Ridge, New Jersey. The sale and partial leaseback of the campus closed in August. Verizon will remain the largest tenant within the office campus, leasing back more than 50 percent of the property. 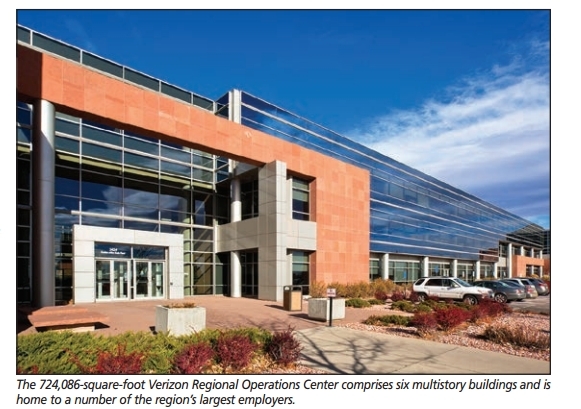 The Colorado Springs transaction is Verizon’s third corporate campus monetization in the last 18 months, part of a three property national portfolio that included earlier sale-leasebacks in Richardson, Texas, in July 2015 and Ashburn, Virginia, in December. “Although a complex transaction, the monetization of Verizon’s Colorado Springs corporate campus presented a true win-win opportunity for the buyer and seller,” said Chad Flynn of the Denver office of CBRE Capital Markets, Institutional Properties. Flynn, along with CBRE Capital Markets, Institutional Properties’ Mike Winn and Tim Richey, also of the Denver office, along with Matt Hargrove and Mike Shellow of CBRE Advisory & Transaction Services|Occupier in Los Angeles and D.J. Decker of CBRE Global Workplace Solutions in Dallas, advised the seller. “We are seeing more and more institutional owners targeting Colorado Springs and the entire Front Range for strategic investment opportunities, drawn in by our region’s outstanding quality of life, strong business climate and top-ranking talent pool,” added Winn. Originally a build-to-suit for IBM, the campus, constructed between 1984 and 1994, has been institutionally owned and maintained since its development. After IBM, it served as a corporate campus for MCI and, upon MCI’s acquisition, Verizon. In addition to Verizon, the multitenant campus also is home to Xerox and PGi. Verizon’s operations on the property span new product development, corporate services, wireless services and Verizon wire line services. “We believe this is the highest quality, best-located, larger-footprint building in the whole city with an ownership that really wants to make things happen,” said Peter Scoville of Colorado Springs Commercial, a Cushman & Wakefield Alliance. Scoville and Greg Phaneuf, also of Colorado Springs Commercial, were part of the sales team and will be handling leasing for the new owner. The pair also handled the leasing of the campus for Verizon. Additional amenities at the campus, comprising six interconnected two-, three- and four-story buildings with 20,000- to 80,000-sf floor plates, include its location along Garden of the Gods – minutes from Interstate 25 and the University of Colorado Colorado Springs – and near the U.S. Air Force Academy and historic Broadmoor Hotel and Golf Club. The new owner also is planning a new auditorium, a new fitness center, to resurface parking lots, add new landscaping and a host of additional common area upgrades.